Yesterday mimics today and today repeats yesterday. Let us blink in a fit of deja-vu then and say that If there were a theme to the later part of this advent series (there isn’t) it might be Artists Who Also Featured In The Unpopular 50/50 Series. All of which is a fairly long-winded way of saying you can read much of what I have say about The Clientele over there/here. Was it a surprise to learn of a new album by The Clientele in 2017, nigh on a decade since their last? Certainly, yes, and yes certainly it was perhaps the most pleasant of all surprises. It has been delightful of course to have had the Amor De Dias records from Alasdair and Lupe in recent years but do you know I would be lying to myself if I said they ever quite filled the gap left by The Clientele for that particular group are perhaps the most treasured of musical artists with whom I feel I have grown to maturity (or some semblance thereof) over the past two decades. Each and every one of their records has touched on me like an angel breathing light into my soul. Rarely has a group blended lyrical and musical intent so perfectly and so beguilingly. Not unlike the second coming of Twin Peaks, you may never have known exactly what their songs were about yet you instinctively understood exactly what Alasdair Maclean meant when he sang. Poetry and Pop in perfect harmony. Didn’t Lawrence once say something about that? Well it may be mildly heretical to say it but do you know I think The Clientele took the blueprints of Felt and over their two decades have made something that in the end has proved to be even more beautiful and everlasting. 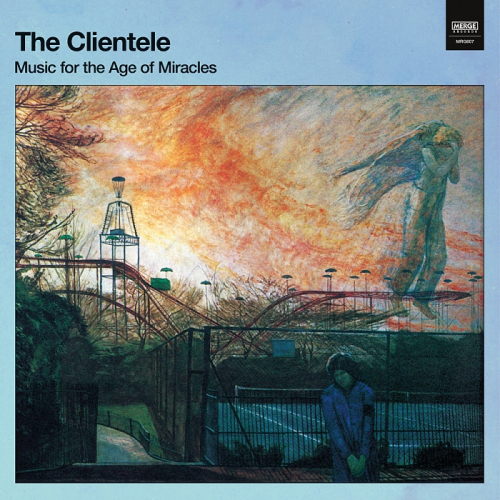 Music For The The Age Of Miracles is classic Clientele. It sounds exactly like a Clientele album ought to and thank heavens for that. Poetry and Pop and then some. Some songs stretch languorously like the mist on the Downs that hovers in the centrefold photograph, and some are blinked interludes; fleeting instrumental touches that soothe and punctuate. Breathe in. Catch the chill of approaching winter and the warmth of anticipated summers in your throat. Breathe out. ‘Lunar Days’, my song of choice, is almost as upbeat as The Clientele ever get (though they kick it out, if one can describe the act as such, even more on the divine ‘Everyone You Meet’), the kind of song where the balance tips ever so slightly towards Pop, though the poetry is always lurking deliciously in the background. Alasdair sings in much the same way as Michael Head now sings, which isn’t to say that he sounds distinctly Mersey but rather that he sings unapologetically in his own voice, his own accent. Anyone wanting to be horribly harsh might sneer about him sounding all BBC and middle class middle-English but that would be to wilfully miss the point and would be to fall into the trap of failing to recognise your allies based simply on the sound of their voice and the language they may or may not use. Certainly Language is important to The Clientele and MacLean relishes the sound of words as much as their meaning. Maybe at times he is like an Elizabeth Fraser with better enunciation and fewer made up words. Maybe not. Certainly in ‘Lunar Days’ he plays with London, deliciously rhyming the song’s title with “Holloway(s)” whilst dropping bus routes and rooting everything around Russell Square. What other group would trip out a line about speaking in “beaten copper tongues” and not sound just a tiny bit self-conscious and awkward doing so? What other group would include the word ‘stanchion’ in a Pop song and make it sound like the most natural thing in the world? Musically it is taught yet supple, spacious yet gorgeously intimate. A Stonesy string riff echoes in the distance, harps pluck the heart strings and though this may be “the year that the monster will come” (and in so many way it certainly was) we drift upwards and onwards on the soft promises of connection and love. God bless The Clientele indeed.